new and irresistible distraction is sure to turn up each day before breakfast. Like the river, we were free to wander." Wow. 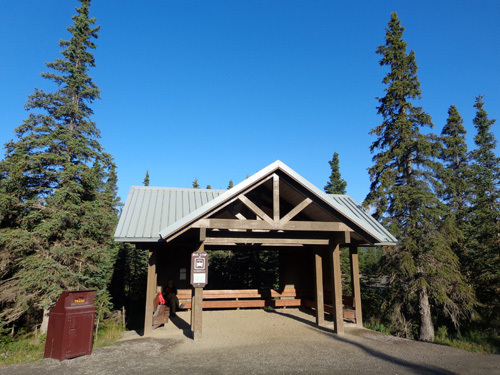 We woke up to a totally clear sky and 40 F. temperature at Teklanika (tek-la-NEE-ka) River Campground this morning. 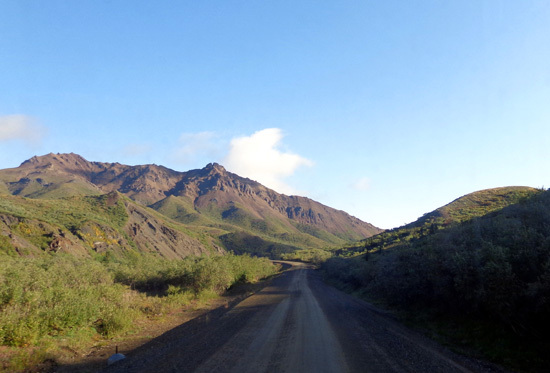 Teklanika is about 1,000 feet higher in elevation than the entrance area of the park (the “front country,” as the rangers call it), so it’s bound to be chillier out here than at Riley Creek Campground. I can’t tell you how excited I was to think maybe we’d get some great views of Denali today on our first shuttle bus ride to the backcountry. We bought our bus tickets on December 1, the first day we could make campground reservations. Who knew that today would be one of the best days this summer to see the mountain everyone is hoping to see?? This is my favorite shot of Denali so far. You should see it at full 16-megapixel resolution! 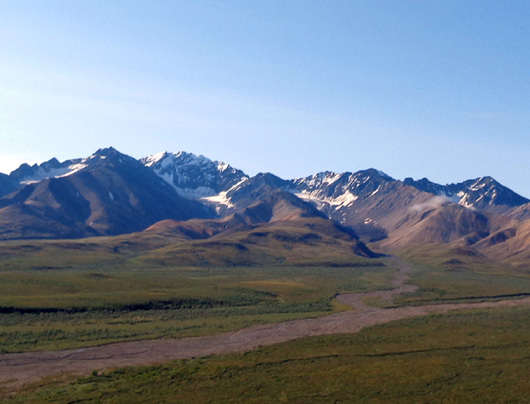 The NE side of Denali facing the Stony Hill overlook at Mile 60 and the Eielson (ILE-son) Visitor Center at Mile 66 was completely “out” when we got to those locations a little before and after 11 AM. 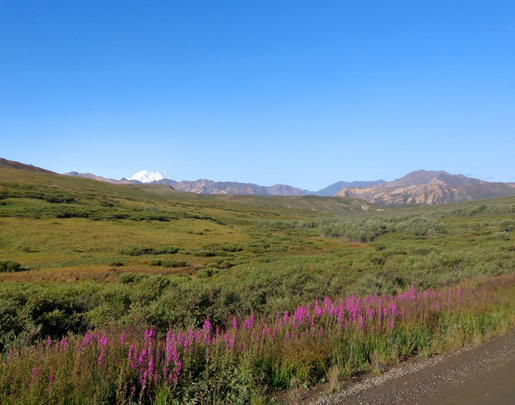 Those were the most magnificent views of Denali we’ve seen so far from the valleys on the park road or along the George Parks Highway. I took the photo above from Stony Hill. 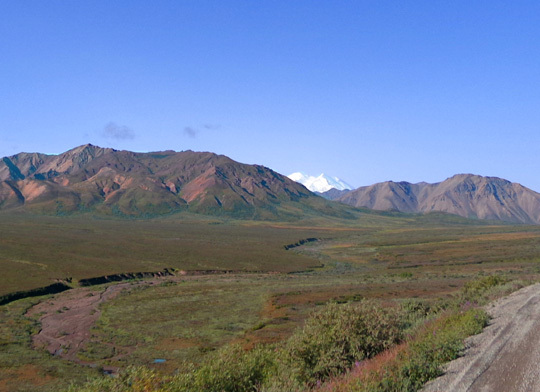 Our bus driver emphasized to us several times that this is as good as it gets re: seeing Denali. 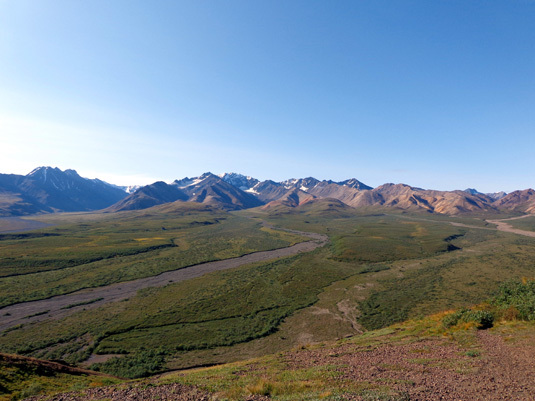 It was amazing how few times over that five-year time period the view of the mountain was clear or even partly clear. 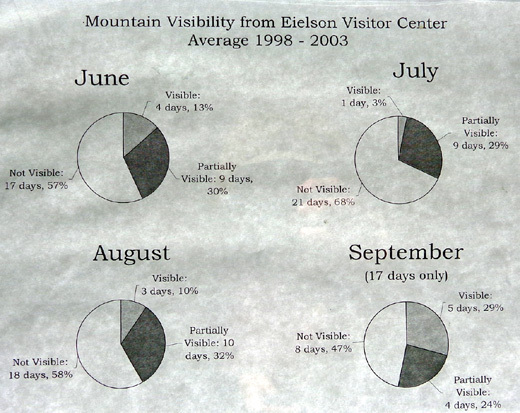 Apparently it's the same now, almost ten years later, per the bus driver, our campground host at Riley Creek, and the all t-shirt designs in stores in Nenana Canyon that boast of being one of the few visitors to see the mountain clearly while visiting the park. We don't need those t-shirts; we have photographic evidence! 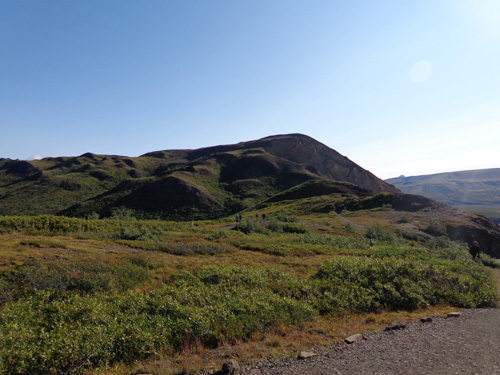 When we left the Eielson Visitor Center about 11:45 AM and continued riding west I noticed small clouds forming near tree line. How quickly those clouds can come in! 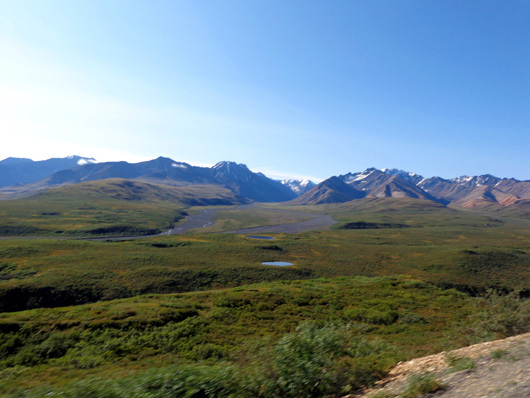 The process continued on the way back to Eielson. By the time we arrived there the second time at about 2 PM (for another half-hour break) we couldn’t see any of the peak at all. Our timing was almost perfect outbound. The only thing better would have been to leave on an earlier bus but we didn’t think we could do that. We found out later that we probably could have. I'll explain more about that in a minute. 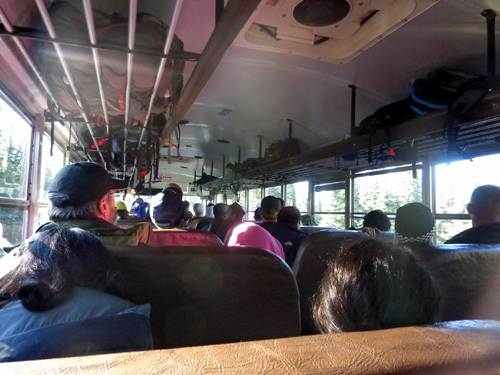 This is the first of six parts describing our shuttle bus ride today from the Teklanika River Campground (Mile 29) to Wonder Lake (Mile 85) and back, a total of about 112 miles. I took close to 500 photos of the magnificent landscape through which we passed and I'm sharing about 140 of them in this series. Because some are a larger size than I've used on this website before, I've limited the number of pictures per page so they'll download faster. Most of the remaining pictures in this series of pages are in order outbound, then on the return. 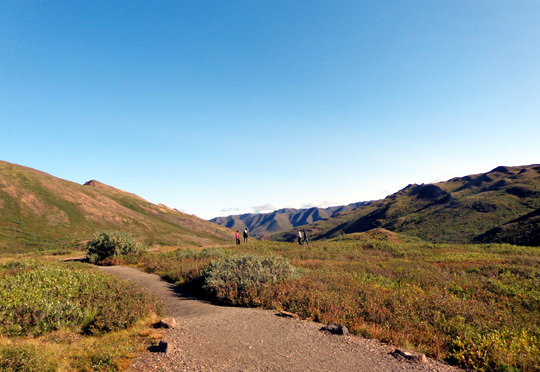 Even if you never plan to visit Denali (especially if you never plan to visit Denali! 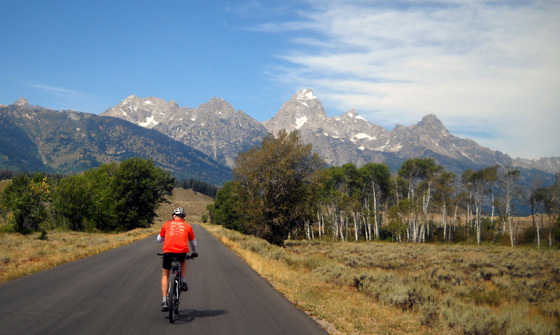 ), sit back and enjoy this virtual ride through one of the most beautiful landscapes in our country . . . I talked about the bus system, the rationale for the bus system, and our "Tek Pass" in the last entry so I won't go into all that again except to explain how we ended up on the particular bus we rode today. Our “Tek Pass” tickets were officially for the Kantishna bus that would arrive at the Teklanika River Campground about 8:55 AM. We got out to the bus stop at 8:25 AM to be sure we didn’t miss it – and to be the first ones on. We figured it would be pretty full of folks who started at the entrance and we might not get to sit together or get even one window seat so I could take pictures. The ideal place for me to sit would be the front right seat next to the window so I could take photos out the front and the side. However, we’d been advised to choose a left side window seat (driver's side) because there are better views that way going outbound. I believe it was Connie from MWR at Greeley AFB that told us that; she was camped near us in Valdez in June and gave us all sorts of good tips re: our Alaska visit. 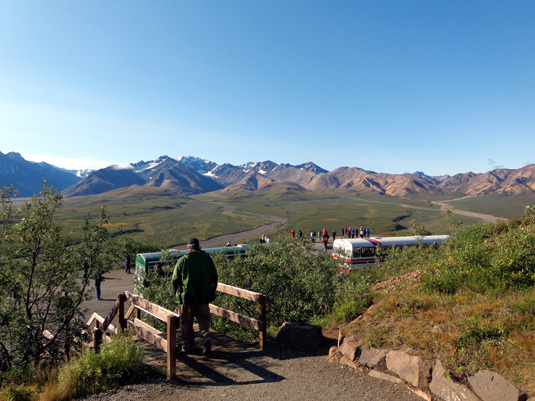 As we waited for our appointed bus several others came by – a few tan tour buses, which didn’t stop, a green shuttle bus going only as far as Eielson, and a camper bus. Right behind the camper bus was a green shuttle bus labeled for Wonder Lake. It had eight available seats and the driver said we could get on it since we'd paid to go even farther. We’d already decided Wonder Lake was probably far enough, especially for our first bus trip. In addition, “our” Kantishna bus wasn’t stopping at Wonder Lake outbound, only on the return. If the driver let us out it would be at the Y with the road that goes down to the lake and we’d have to walk in about a mile to reach the lake and the area where the buses load and unload. Then we'd either have to get on another bus back to Tek or wait for the one from Kantishna we were originally supposed to ride. It sounded more complicated than we wanted. There was also the time factor. 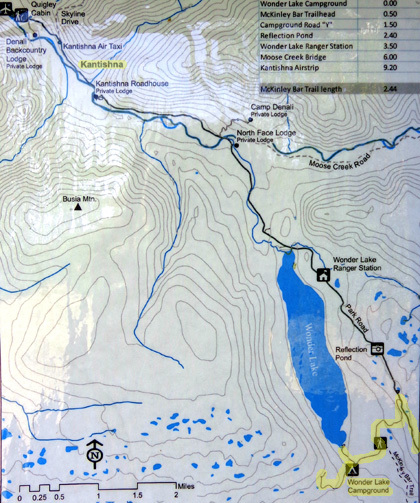 If we went another 14 miles out and back to Kantishna we wouldn’t get home until one or two hours later (about 8 PM) than if we "just" went to Wonder Lake. Twelve hours was a long time to leave Cody alone, although he's done it before. We’d been studying that bus schedule like there was gonna be a test. The above facts took us about ten seconds to digest and we made the decision to board the Wonder Lake bus instead of our own to Kantishna. A family of five from our campground also boarded this bus. 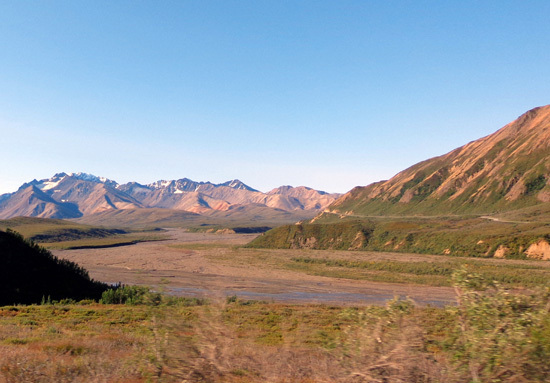 They had purchased tickets only as far as Eielson but the driver generously let them go out farther to Wonder Lake. I wouldn't count on being able to do that, however. They got more than they paid for. 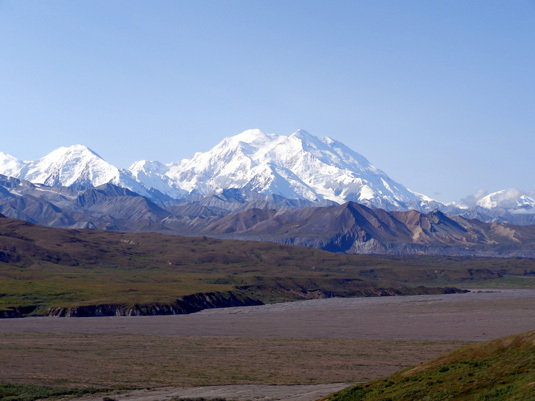 I probably shouldn't broadcast this on the internet but the advice to sit in the row of seats behind the driver on the outbound was spot on – I think that’s the side with the best views, including Denali. That way the impressive Alaska Range is usually on your left. That picture's not so good because of the poor lighting and very limited time spent leaning over the folks sitting in the seat across from us! It's a lot easier to take pictures on the side where you're sitting, although passengers should be courteous and share opportunities to take photos. The folks sitting near us were all pretty good about that. Another time the right side is better is at Stony Hill outbound. 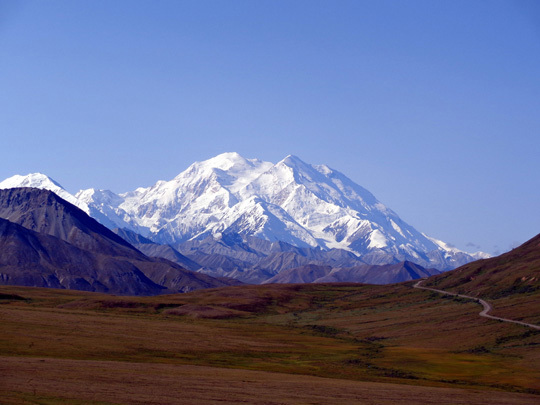 I got my best picture of Denali there but I took it from outside the bus when the driver stopped for several minutes so folks could get out if they wanted. The back seat was good for us, too, because I was up and down a lot in my seat and would have driven someone behind me nuts. My window was jammed and would come down from the top only a quarter of the way. To get the most clear pictures I had to prop myself up on my left elbow on the back of my seat to point my camera out the window that wouldn't open very far. It was tricky to see the screen. When I shot through the glass I usually had reflections that marred the pictures. I have only so much time and patience to edit poor photos like that. I took the majority of my photos while the bus was moving. Hence, some of the foregrounds are a little blurry. 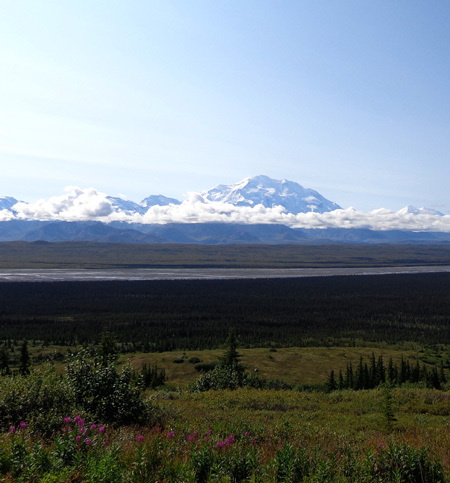 Above and below: Yay, there's Denali!! 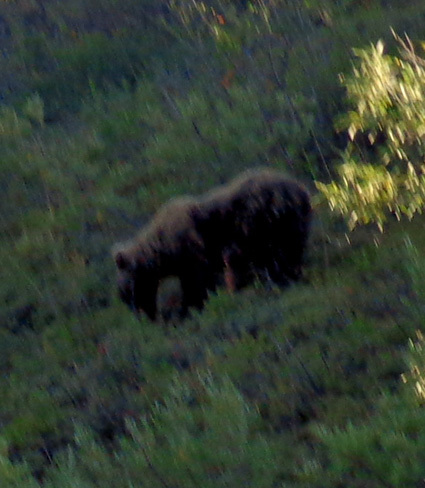 I took these pictures near Sable Pass. On the return trip the folks who were in the right back seat weren’t on the bus so we took that seat all the way back to Tek, again being on the south side with some (not all) of the better views. That window did come halfway down so it was a little easier for me to take pictures. I also learned to just point and shoot without having my eyes at the same level as the viewing screen. Those pictures came out about as well as the ones I could see on the screen. Jim was fine in an aisle seat next to me, although on the return he couldn’t stretch out his bad right knee in the aisle like he could on the other side. 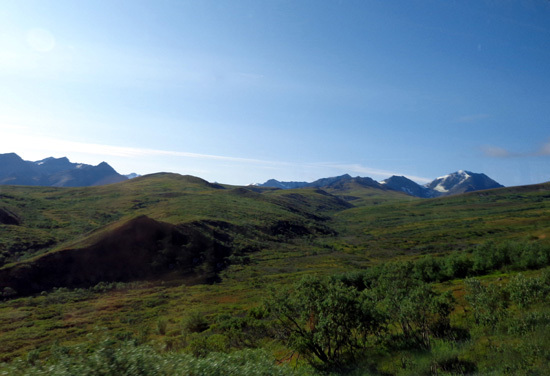 He originally thought he’d get off at Eielson and catch a bus back home but decided to continue on to Wonder Lake because of 1) the sunny views of Denali that we had at Eielson (which soon deteriorated), 2) the promise of lots of blueberries at Wonder Lake and 3) the hope of seeing more bears and other critters. We got our first introduction to the colorful hills for several miles on either side of Polychrome Mountain during our flight-seeing tour of the park two days ago. We were very curious to see that area more closely. 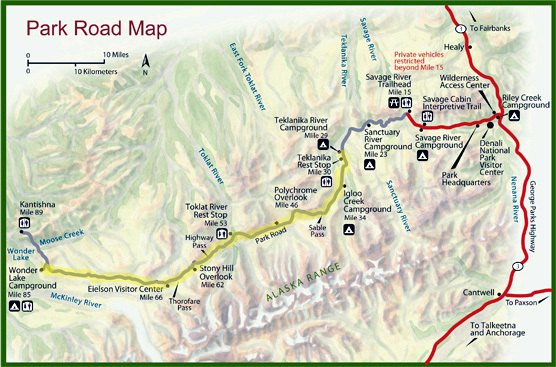 If you look at the map farther up this page you'll see that Polychrome Mountain and overlook are in the miles between the Toklat (TOW-klat) River and its east fork. 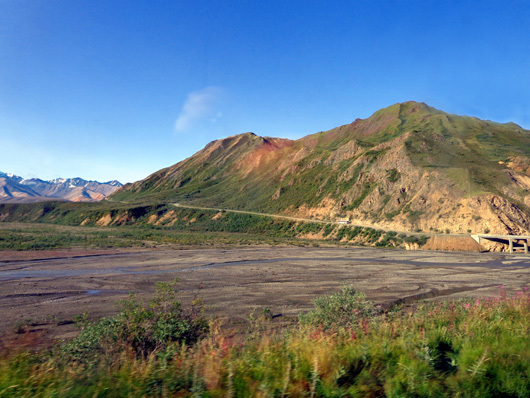 The colorful hills are on the north side of the narrow road that winds its way high above the large drainage area from the mountains and glaciers to the south. 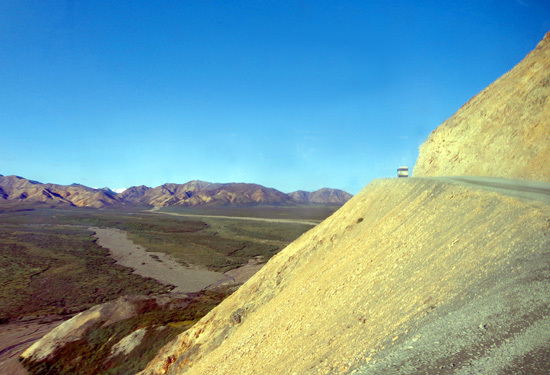 Polychrome Glacier is the biggest and most visible from the roadway. The remaining photos on this page are from this beautiful area, which would be fun to explore on foot. 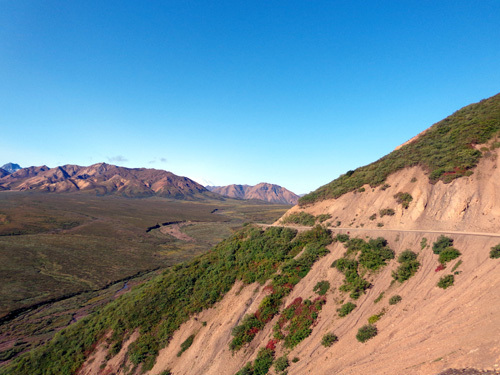 the park road gradually rises 200-300 feet above the valley. 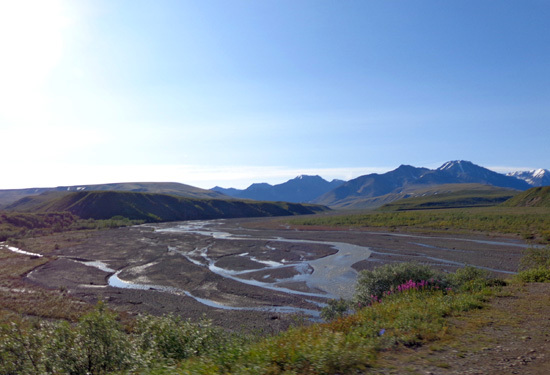 Like many rivers along the park road, the Toklat and its east fork are wide, braided sand/rock bars. 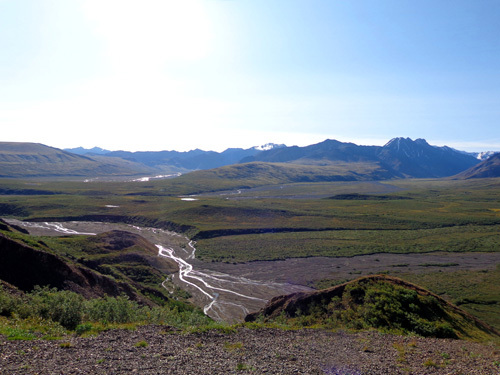 Water in the streams and little ponds comes from rainwater, snow, and glaciers in the nearby Alaska Range. of the bus when traveling outbound! It's even worse coming back and you're on the cliff side. 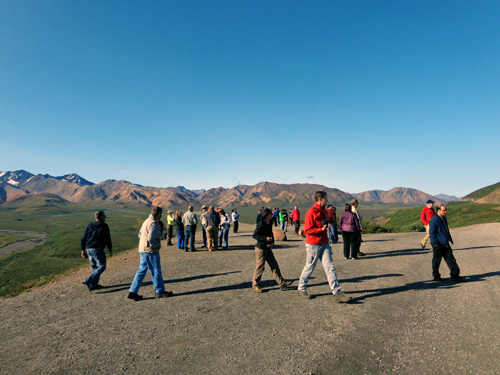 Shuttle and tour buses routinely stop at the Polychrome Overlook going outbound in the morning. There is room for several buses at once. I'm glad only one other bus was there when we stopped. Since Jim and I were in the back seat we were usually the last folks off the bus at each stop. The stops were long enough that it wasn't a problem re: views, bathrooms, etc. The taller peak in the background is 7,840-foot Mount Pendleton. 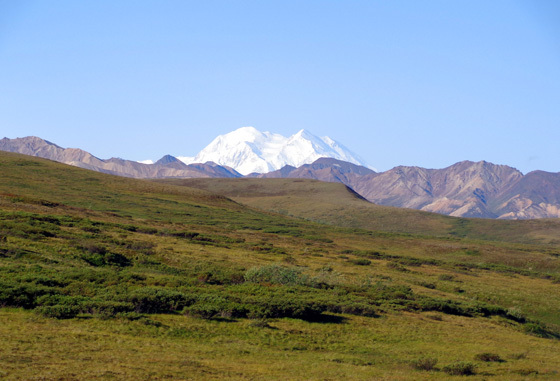 When you get clear views of Denali like we had today, the mountain is said to be "out."